12 frets to the body, red cedar top, SB tuners. This guitar is unusual because, for one, it is a Favino D hole, with a very small D hole at that. 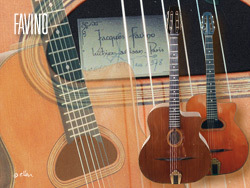 This instrument was most likely built by Jean-Pierre, although it is signed by the father, Jacques, as he apparently did for all Favino’s produced in their shop up through 1981. The original Favino tailpiece was replaced somewhere along the line with a DuPont tailpiece. I acquired this guitar from Jacques Mazzoleni at the Classic American Guitar Show on Long Island in May of 1998. The superb sound is vintage “Favino”. 14 frets to the body, dark red cedar top, SB tuners. This Favino was acquired from Jacques in December 2004, he having just acquired it himself in Paris. It shows the wear & tear of a hard gypsy life, but the quality of the sound exceeds that of my D hole. The SB’s tune “backwards”.